WASHINGTON, D.C. -- Last year, 42% of Americans, on average, identified as political independents, erasing the decline to 39% seen in the 2016 presidential election year. Independent identification is just one percentage point below the high of 43% in 2014. Twenty-nine percent of Americans identify themselves as Democrats and 27% as Republicans. The dip in independent identification in 2016 and recovery in 2017 is a typical pattern for a presidential election year and the year after. Latent partisanship in some independents is likely activated in the highly political environment of a presidential campaign, but fades once the election is over. However, the three-point increase in the proportion of independents in 2017 is larger than what Gallup typically has seen in the year after a presidential election. The average over the past eight presidential elections has been a one-point increase, although the increase has tended to be larger since 2005. In contrast to the average one-point increase in independent identification in the year after a presidential election year, the average decrease during a presidential election year is three points. These historical patterns suggest that the percentage of independents would generally not revert back to its pre-election level as quickly as it did this last cycle. 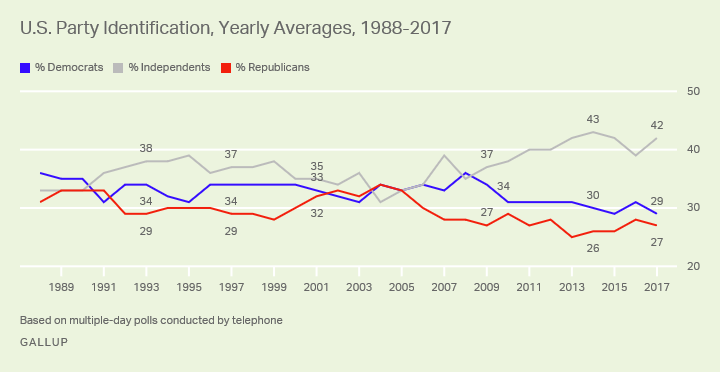 With a nearly record-high proportion of Americans identifying as independents in 2017, it follows that identification with the two major parties is near the historical low for each. In fact, the 29% of Americans who identify as Democrats ties 2015 as the lowest in Gallup's trend for that party. Republican identification (27%) is two points above its low of 25% in 2013. 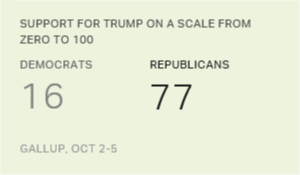 More Americans typically identify as Democrats than as Republicans, but Democrats' two-point advantage in 2017 is on the lower end of Gallup's annual trend. Most people who initially identify as independents will express a "leaning" toward one of the major parties if probed. 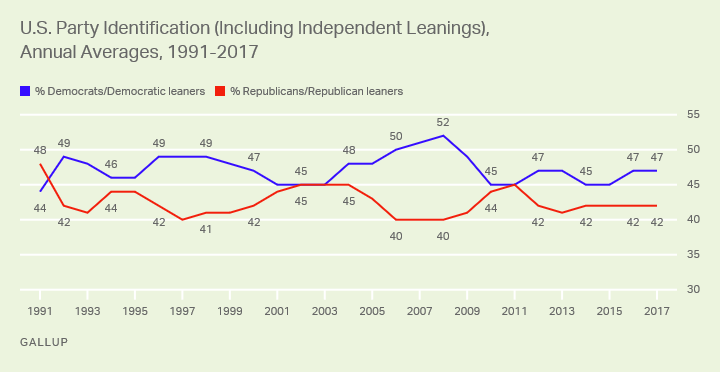 Gallup has asked independents for their party leanings consistently since 1991. In addition to the 29% of Americans who identify as Democrats, another 18% initially identify as independents but when asked say they lean toward the Democratic Party, resulting in a combined 47% of Democratic identifiers and leaners. Meanwhile, 42% of Americans identify as Republicans (27%) or are Republican-leaning independents (15%). The five-point Democratic advantage in this combined measure of party affiliation was the same in 2017 as in 2016, but higher than the three-point Democratic leads in 2014 and 2015. Since 1991, the average has been a five-point Democratic edge. The record high for Democrats was 12 points in 2008, the year Barack Obama was elected president -- replacing George W. Bush, whose popularity was low amid the ongoing Iraq War and an economic recession. The high for Republicans was a four-point GOP advantage in 1991, the year George H.W. Bush presided over a quick and decisive U.S. victory in the Gulf War. Democrats' advantage in leaned party affiliation appears to be expanding, as it was six points (46% to 40%) in the fourth quarter of 2017 compared with four points in both the second and third quarters. Gallup found similar Democratic gains late in the year in an analysis of monthly data from its daily tracking survey. Americans' frustrations with the way the government is working and their generally low favorable ratings of the two major parties are two reasons why more identify politically as independents. With neither party held in high esteem, it makes sense that an increasing percentage of Americans would be reluctant to express an affinity for either one. Greater political independence could mean voters are more likely to act as free agents when casting ballots in federal elections. Such a dynamic might explain the strong performances of anti-establishment candidates Donald Trump and Bernie Sanders in the 2016 presidential primaries. It could also explain the more frequent changes in party control of Congress, with the majority party in the House of Representatives switching three times since 1994 -- after the 1994, 2006 and 2010 midterm elections -- after 40 consecutive years of Democratic House majorities. Americans will vote in midterm elections this fall to elect a new Congress -- and with an unpopular incumbent president, the increase in independents may only escalate the chances that party control of Congress will change hands once again. 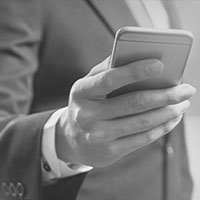 Results for this Gallup poll are based on telephone interviews conducted in 2017 with a random sample of 13,185 adults, aged 18 and older, living in all 50 U.S. states and the District of Columbia. For results based on the total sample of national adults, the margin of sampling error is ±1 percentage point at the 95% confidence level. All reported margins of sampling error include computed design effects for weighting. 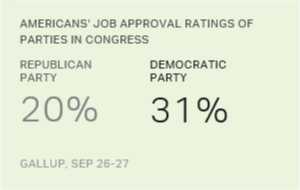 Americans' job approval ratings of the Republicans (20%) and Democrats (31%) in Congress are at or near the low points in Gallup's trend.